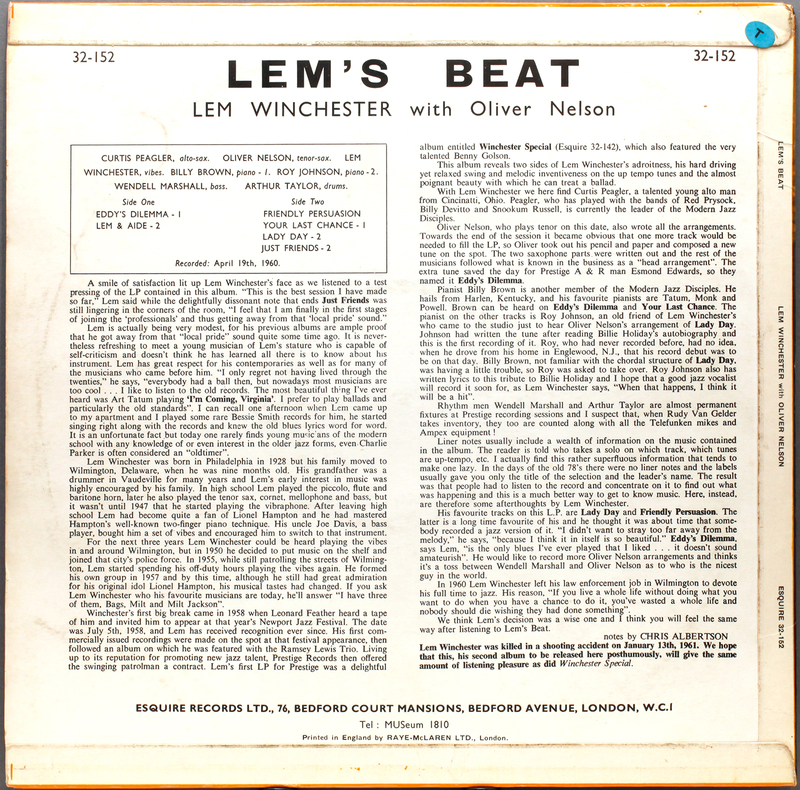 A serving policeman briefly turned professional musician and a name linked with a famous rifle offers a rich choice for play on words Winchester’s second album Lem’s Beat is no exception. The vibraphonist draws heavily on Oliver Nelson and his sidesmen and arguably its as much Oliver Nelson’s record with half the songs to his credit. With distinctive vibraphone sound associated with Milt Jackson, the presence of the sextet prevents if from falling into the MJQ mould. Bobby Hutcherson and Walt Dickerson were the few vibraphone players who managed to break with that pervasive association, not to mention our own Tubby Hayes. Winchester was killed in a shooting accident in 1961, which brought his recording career, not to mention his life, to an abrupt end. Prestige’s New Jazz label suffered more than most from the intermittent use of substandard vinyl so the UK release is a surefire way around the problem, even if it does involve the bizarre artistic (lack of) judgement in cover design. This time Esquire opted for no good reason to re-colour the original orange – Lem’s been Tango’d..
New Jazz US stampers with RVG stamp. Source: Ebay Sellers Description not recorded but VG+ cover and record. Modest record modest price, easyupbeat bop session. also starring “myself” of course. Hopefully YouTube geographical restrictions don’t apply. 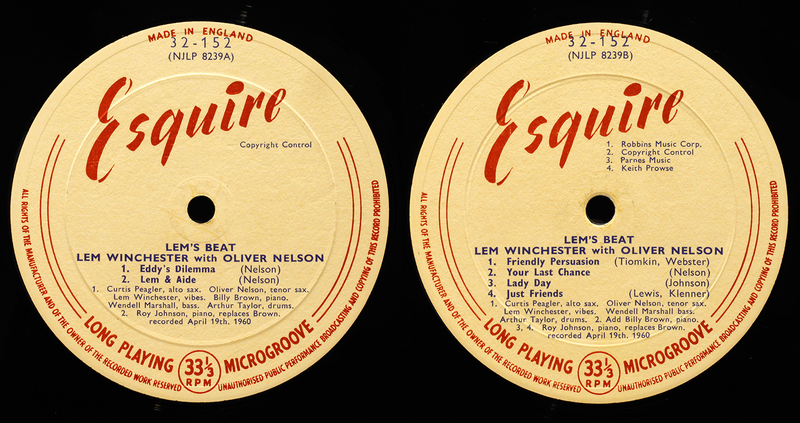 This entry was posted in Esquire, Lem Winchester and tagged Art Taylor, Billy Brown, Curtis Peagler, Esquire, Lem Winchester, Oliver Nelson, Prestige, Roy Johnson, Wendell Marshall by LondonJazzCollector. Bookmark the permalink. 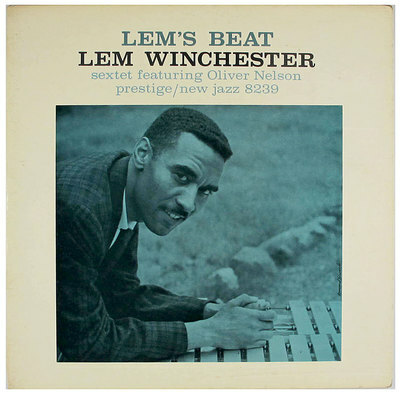 Thanks for this; I must admit, I was not familiar with Lem’s work. I appreciate the enlightenment! Another great feature of vinyl – the amazingly informative liner notes. Poor unlucky Lem. I have Lem Winchester and the Ramsey Lewis Trio (Argo 642) and With Feeling (Moodsville 11), and the liner notes of those two records tell his sad story. The Argo record was released before his death, and describes how he was married, had three young sons, and was only 9 years away from his police pension. He was wresting with quitting the police and working as a full time jazz musician, i.e., trading the security of the police for a shot at the big time. The Moodsville record was released just after his death, and describes how he did, in fact, quit the police and made a go of it, but also how he made a morbid sense of humor which led him to drive a hearse as a tour bus, and also to perform a pistol trick for the guys in the club after shows. (The following piece of info is not from the liner notes, which just state he died in a gun mishap. Apparently, he would play Russian Roulette with his service pistol, but one night he borrowed another gun, and chamber of which spun the opposite direction). And that is how Lem, unfortunately, became the vibes player in the Jazz Musicians Who Died Too Young All-Star Band (which is a hell of a fantastic group). The Argo disc is interesting – and very darkly ironic – as it’s a tribute to Clifford Brown, who, of course, was one of the first post-swing-era jazz geniuses to die tragically at a young age. Nice record, enjoyable and great sounding original Argo pressing, but nothing special. The Moodsville record is absolutely terrific. 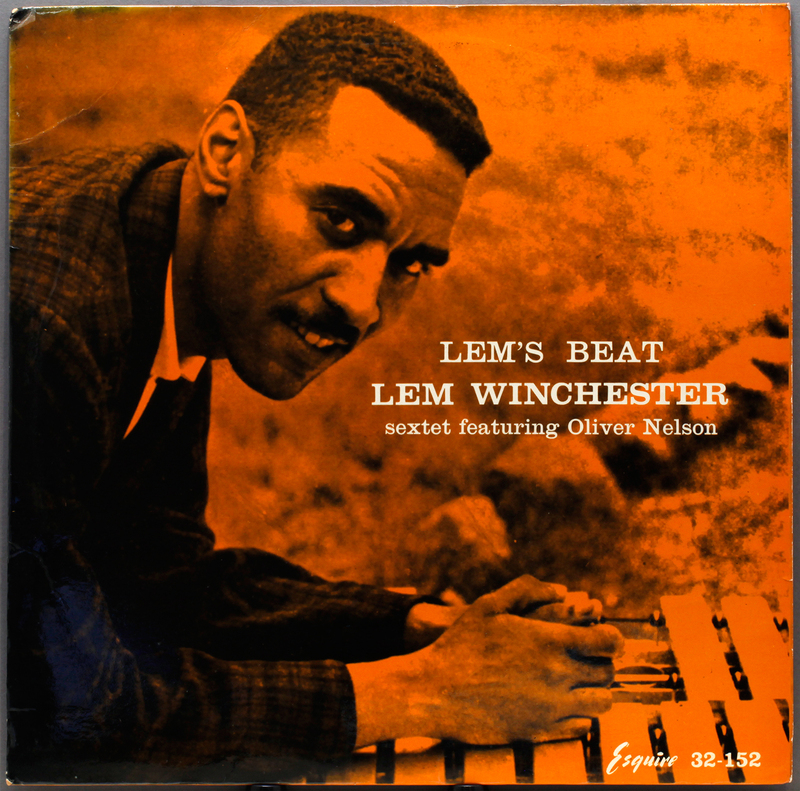 Lem on vibes, Roy Haynes on drums, George Duvivier on bass, and Richard Wyands on piano. Superb Prestige-at-its-best pressing on heavy vinyl, deep groove, RVG in the matrix. Their version of “Skylark” is lovely. It’s a quiet record, but recommended. It’s a shame he’s not better known. 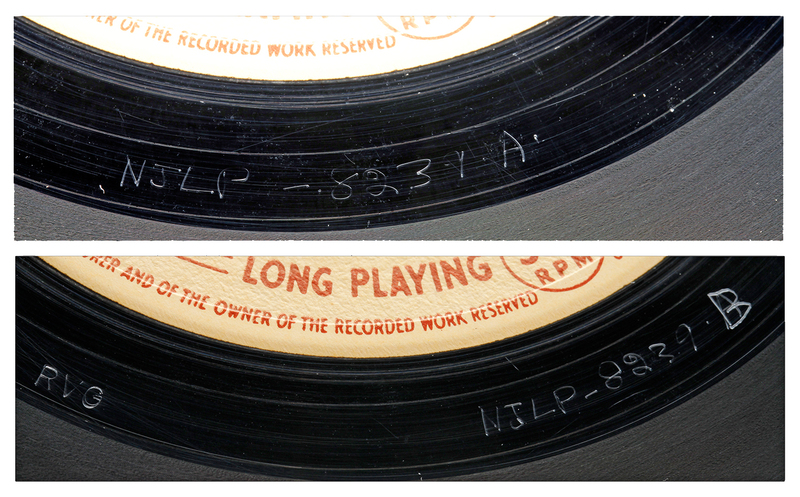 Thanks for filling in the picture – I knew only what the Esquire liner notes told me, which is short measure. A sad story. The Moodsville sounds like one to look out for. Roy Haynes, yesss.